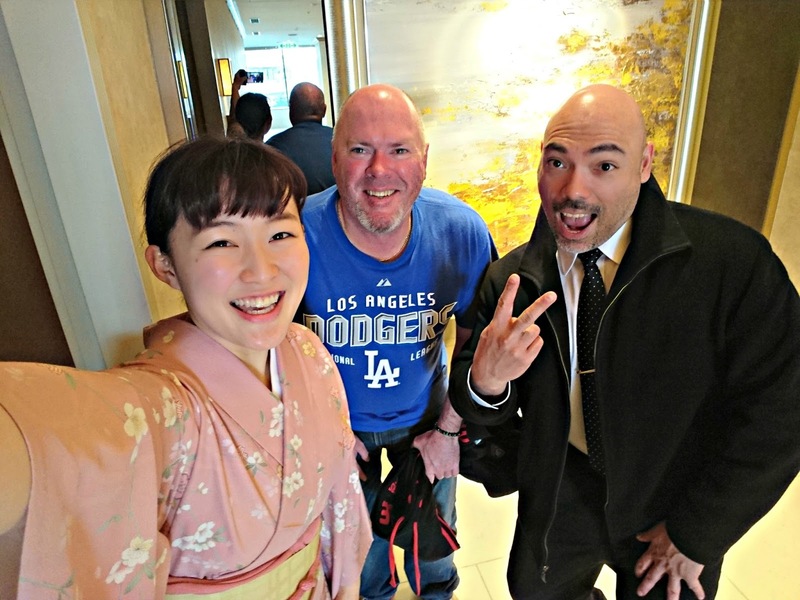 One of my students, Natsumi worked at one of the restaurants in the Hilton Hotel Odaiba and I had been meaning to go there one of these days to eat at her restaurant. 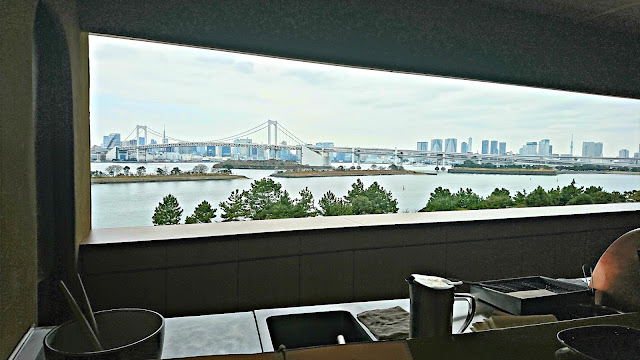 Well she recently told me that she was changing jobs soon so the decision was made to go and have lunch at Sakura restaurant at the Hilton Odaiba. I asked Tetsuya if he was willing, being a former chef, he is always willing when there is food involved. I met Tetsuya at the hotel and we made our way to the restaurant and were lead to our seats. Now the Sakura restaurant has 4 different areas. The main restaurant, the teppanyaki counter, the sushi counter and the tempura counter. Natsumi had recommended the tempura counter as it was the one with the best view. She certainly wasn't wrong! Soon after being seated our tools were placed in front of us! Soon after came a small appetizer. 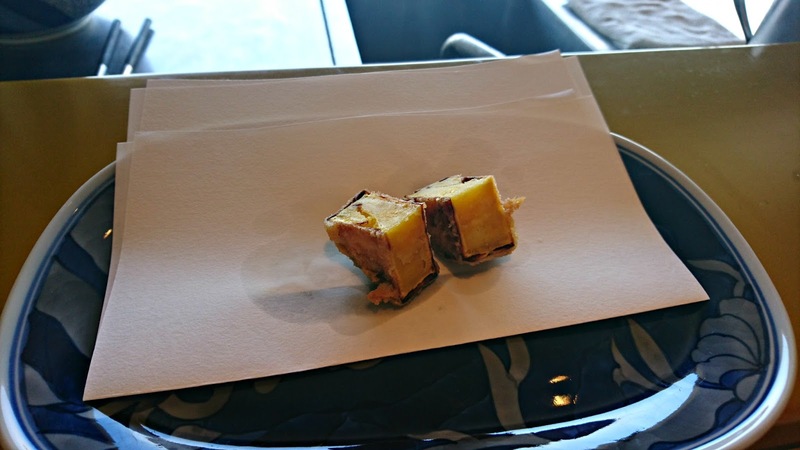 Next, the chef brought out a sample of what he would be cooking up for us. 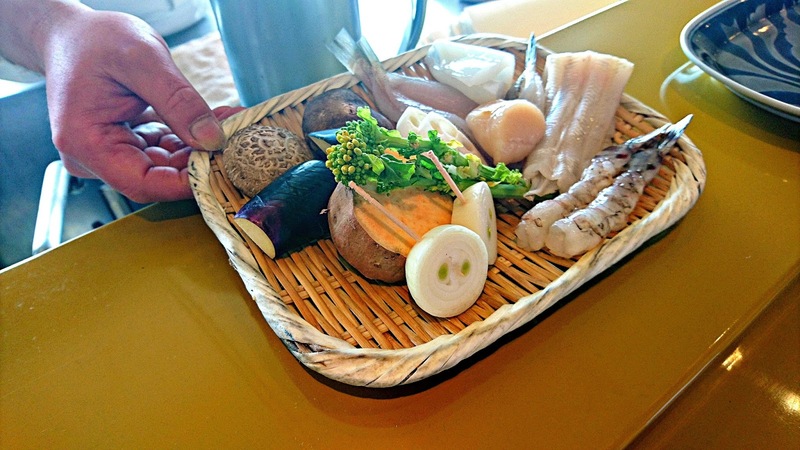 I nice selection of seafood and vegetables. Now I am not a big lover of shrimp / prawns so he had included some extra fish for me. As he began cooking, Tetsuya asked him how long he had been working in this restaurant. "22 years, since the hotel opened". Wow, our food was certainly being cooked by one impressive chef! 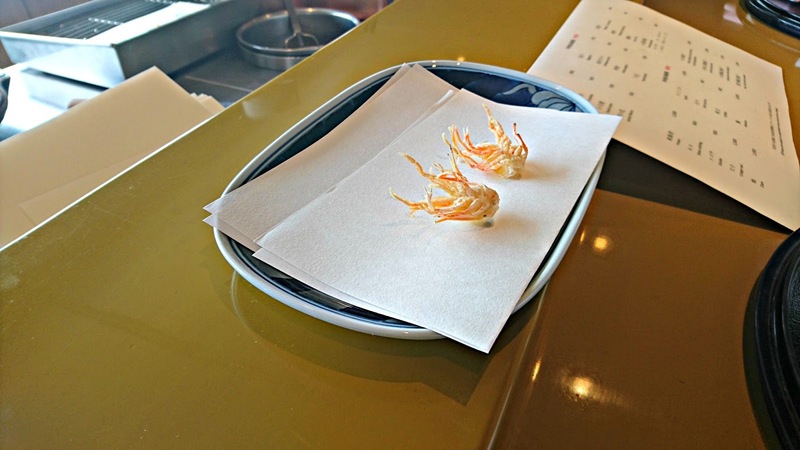 First up, Tetsuya was served some little tempura shrimp legs. while on my plate, whiting (シロギス). Now whiting are a hugely popular fish variety in Australia and they have a very delicate, light taste. This took me back to my childhood when I used to catch whiting with my Uncle and Grandfather! Next up was some canola flower. These had a nice fresh, herbaceous, light oily taste to them. This was my first time to eat these and they were good. After that came some lotus root (レンコン). Lotus root is a vegetable that I love, the starchy crunchiness was wonderful so this disappeared pretty quickly! 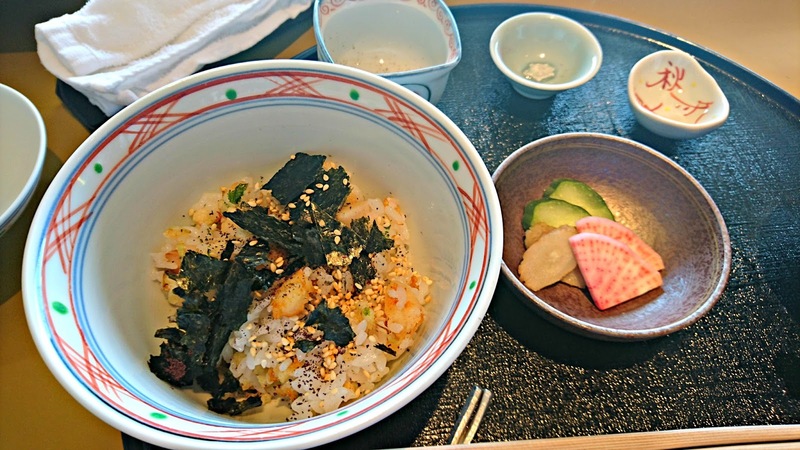 At about this point I realised that the chef was preparing each ingredient separately and timing the serving with perfection, a short wait after the previous one, just like a good sushi chef does. He would start preparing each one as we were enjoying the previous one. 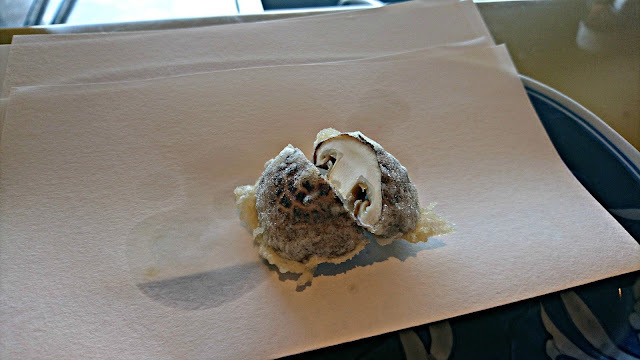 Next up was a scallop (ホタテ貝). 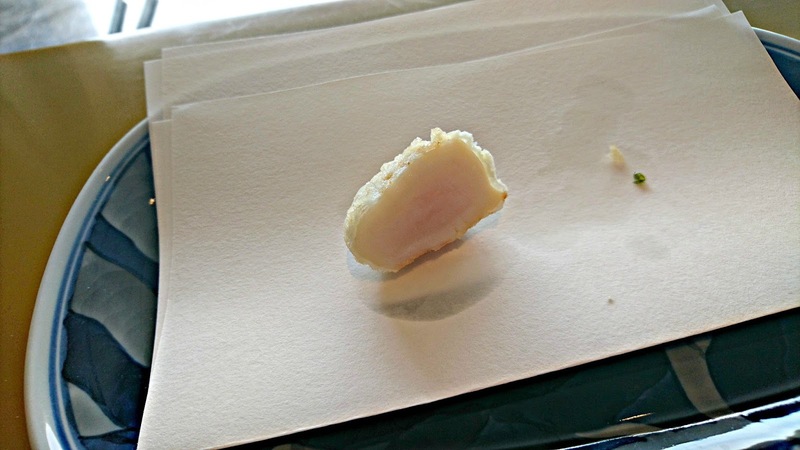 I am not a big eater of scallops so I am not really qualified to comment on the taste of this one. 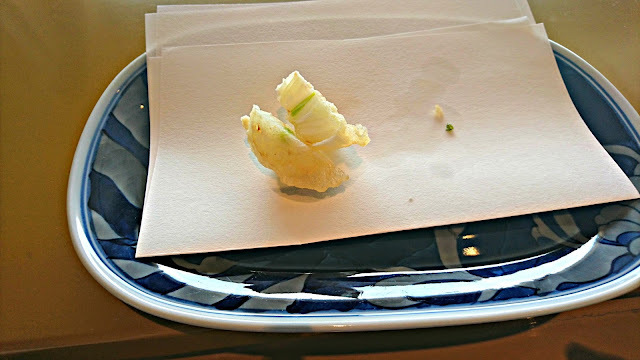 This was soon followed by a slice of onion (玉ねぎ). 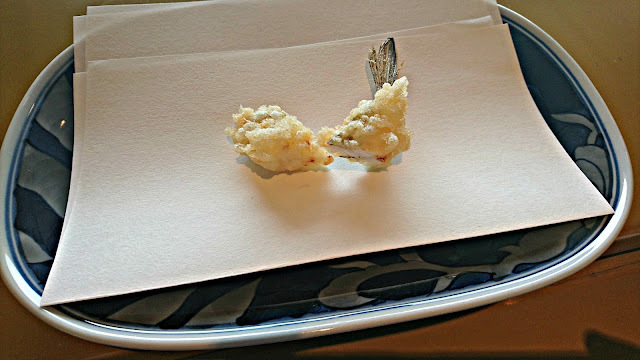 Now, I had never had tempura onion before now, so this seemed to be a strange choice, but it really worked. The onion had been cooked to perfection, retaining enough juiciness and crunchiness that, combined with the crisp tempura coating, made this one of the highlights! And here's another quick shot of the onion (with that wonderful view....). Next the chef serve up some lightly battered squid (いか). 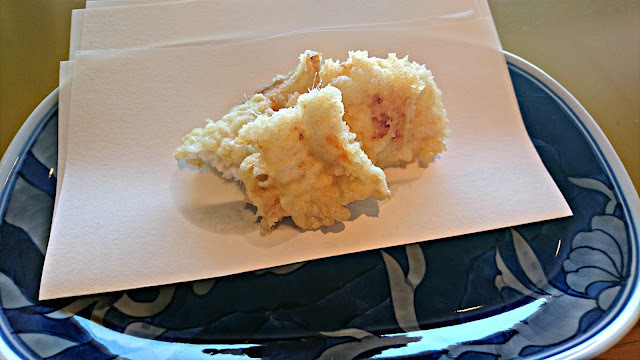 As with the shrimp and scallops, I don't eat a lot of shrimp but the crunchy texture of the batter contrasted nicely with the chewy texture of the squid. Next was a little piece of shiitake mushroom. 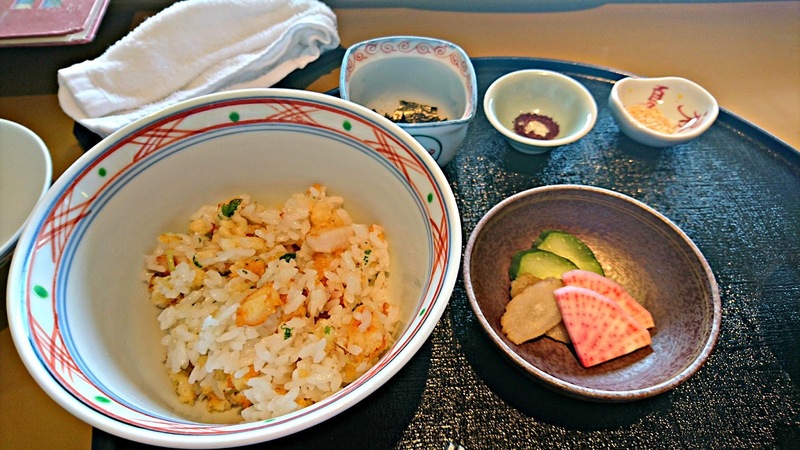 This was followed by some tempura eggplant (ナス). This was so soft and tender, the chef had cooked this one to perfection. I noticed at this stage that he was watching us eating and starting to prepare the next item accordingly. Each required different cooking times and he was timing everything to perfection. 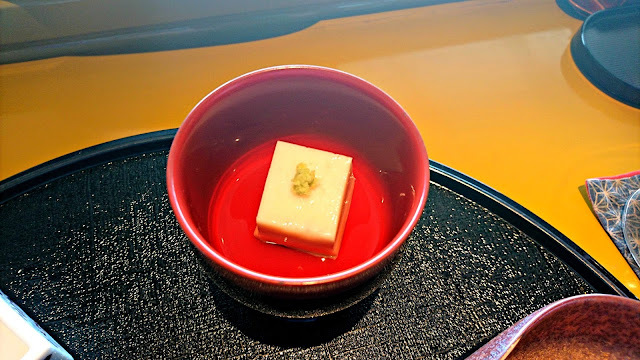 Next up was a Japanese favourite, loved by so many people here, sweet potato (薩摩芋). The chef told us not to season this with anything, just to eat it straight. While not a big fan of sweet potato, I would have liked to dip this one in a sauce, but I'm sure fans of sweet potato would love it! After that came some saltwater eel (穴子). 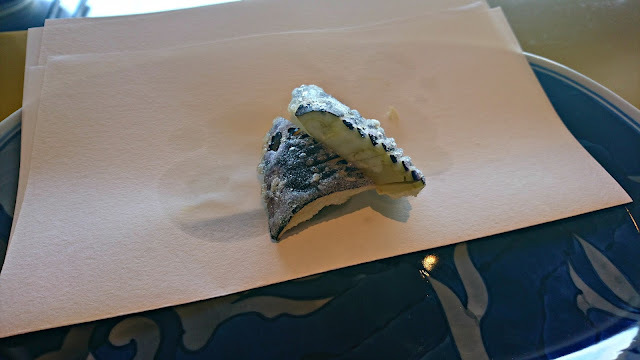 Freshwater eel (鰻) is more common in Japan, but this one was a good match for tempura. Soft and tender and with a delicate flavour. 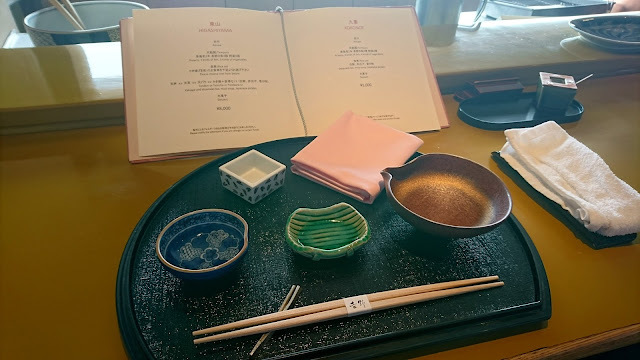 With that item, we had reached the end of our course but suddenly Natsumi came out and told us that the chef wanted to prepare us an extra dish for free! We settled on a rice dish with chopped up tempura pieces mixed in. The condiments were seaweed, eucaly (I am guessing this comes from the Australian eucalyptus tree, please correct me if I am wrong) and sesame seeds. 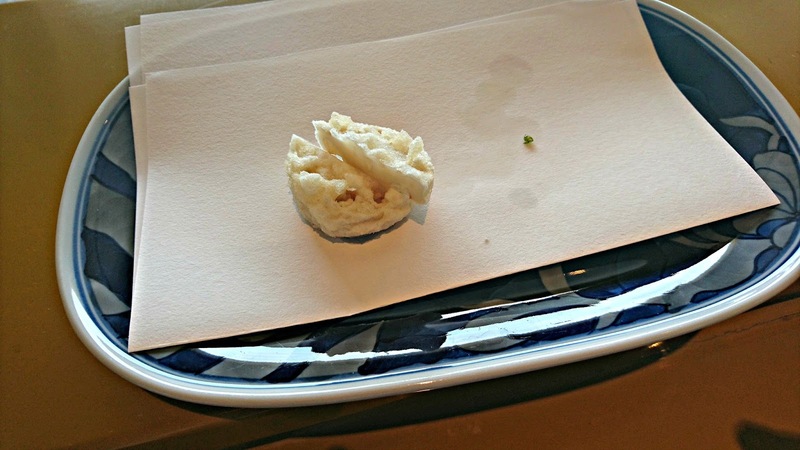 These were promptly thrown in top of the rice bowl. After polishing this one off, we were served with desert, mochi balls with sweet red beans (sorry, couldn't find a Japanese translation). And just like that, it was all over. It had been an amazing dining experience. 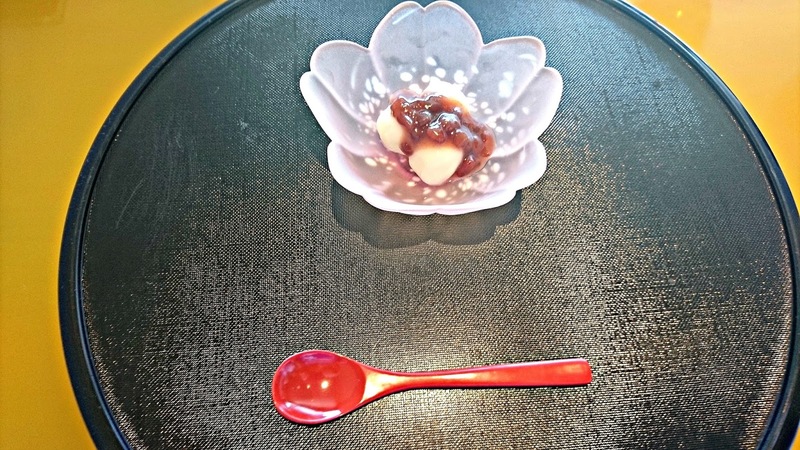 The chef was an utter professional and delivered a complete dining experience. 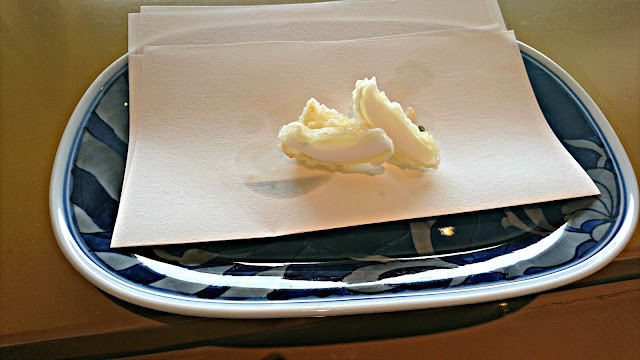 My thanks goes to Natsumi and her chef at the tempura counter at the Hilton Hotel Odaiba. We had a great time! Well, that's it for another post. 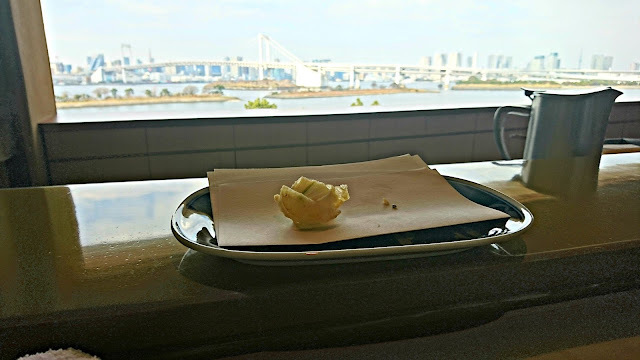 I highly recommend going to the Hilton Odaiba, Sakura restaurant for a high class dining experience. I thoroughly enjoyed it! Thanks for reading. Please leave a message below and sign up for email updates on the right side of the screen. Also, please share the post if you know anyone who would like to read. Take care, and see you next time. 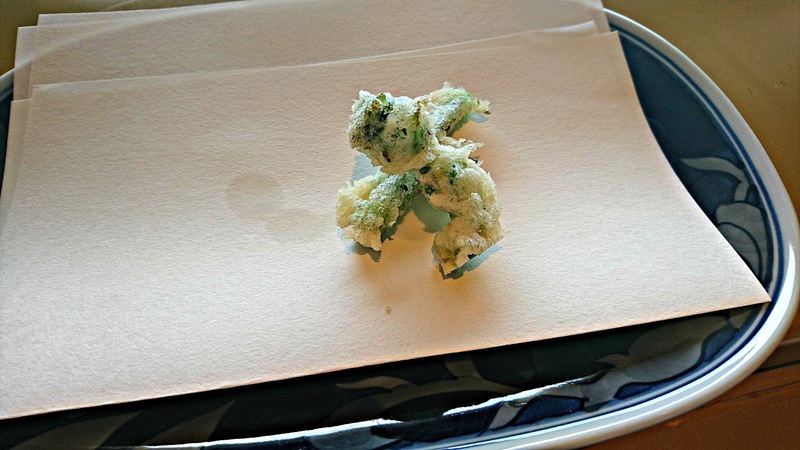 Cost: tempura course - 5,000 yen.